Information has been received over the wire reports this morning that the juvenile rolling stone has been caught in another act of random mischief. This time, the act took place in a local Target department store in the south. The juvenile rolling stone was caught on store security riding a tan in color skateboard down the sporting goods aisle. In one part of the video, you can actually see where the skateboard goes around a human wearing orange clogs and then runs into a display shaking his little pebble head from the impact. One witness who wishes to remain anonymous, we’ll call him Mr. Smith, stated the juvenile rolling stone was acting like “he didn’t have a care in the world“. Mr. Smith stated he told him at one time to put the skateboard away so that he would not get hurt. The juvenile rolling stone stuck his tongue out and told the employee, “Make me”, before he took down another aisle riding the board. Mr. Smith followed him and inquired where his parents were. The juvenile rolling stone replied, “Papa was a rolling stone” before laughing hilariously. This goes to show that the juvenile rolling stone is becoming more mischievous. Last month, authorities reported that the juvenile rolling stone created havoc by riding a blue skateboard carelessly throughout the Walmart department store. He was observed skateboarding down aisles of the store in the toy department in between humans feet. He was even overheard shouting at the Walmart workers, “Whee, whee, whee!” and “Catch me if you can”. Authorities have released a video from the security camera at Target of the juvenile rolling stone perpetrator showing his disturbance. Authorities are asking you not to approach the juvenile rolling stone in case he casts the first pebble. If you recognize this juvenile, please comment in the postings. All postings will be confidential. Let me start by saying that this posting has LOTS of food in it with pictures. You know my mom and dad – they are professional eaters. They get into trouble every possible way. They called a field trip this past weekend. 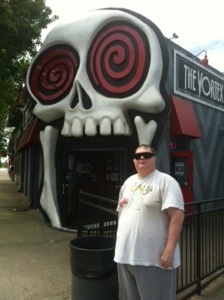 There is a restaurant about 30 minutes away called The Vortex Bar and Grill in an area called Little Five Points. They say it’s awesome. First off, it’s a bar and most of the workers have tattoos and no one under the age of 18 can come into the restaurant. I guess that leaves me out since I’m just over two – snorts. This is daddy posing outside of the entrance to the location. 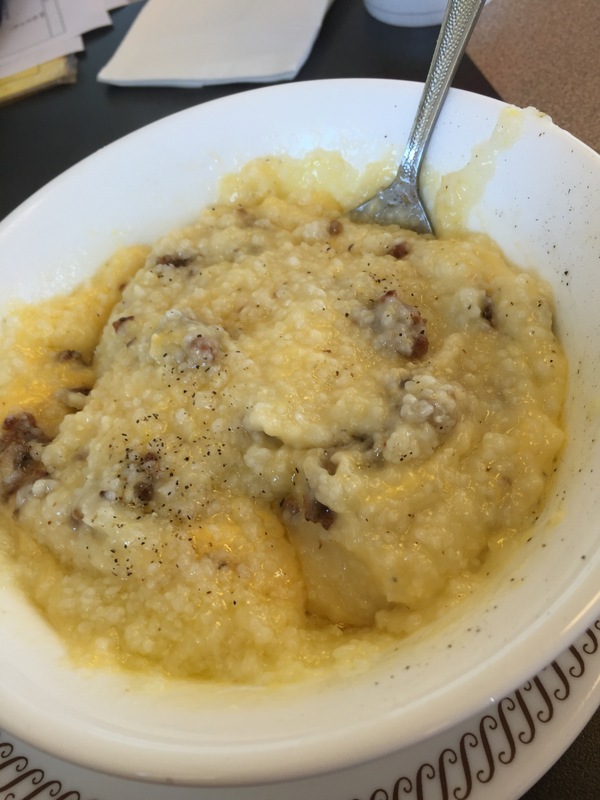 I know I’ve talked about this restaurant before but I’m not sure if I’ve posted pictures of the awesome food – which mom and dad say is awesome…. shuffles hooves… I wouldn’t know because someone didn’t bring me home a piggy bag. Like I was saying, the front of the building near the entrance has the huge skull that you walk through. Scary looking huh? You can see the name of the restaurant on the side to the right of dad’s head. NOTE: Someone told mommy that it looks like daddy has rabbit ears over his head from the jaw line of the skull. Snorts – I think it does too. You? The day that mom/dad went, there was no line. Usually the line is out the door. Inside of the location, it’s dark and cozy. Mom and dad say the inside is rather small so the tables are tight. You make friends really quick – snorts. Yep, that’s what it says. 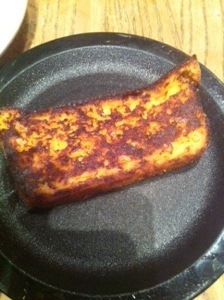 The picture to the left is of the cornbread that comes with the chili. 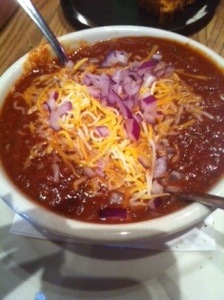 Daddy says you really needed that because the chili was H.H.O.O.T.T. Thank goodness mom and dad split a bowl – snorts. 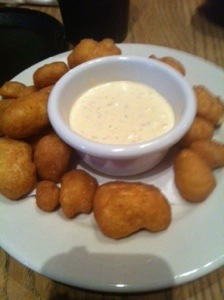 “A plate full of beer-battered, deep fried balls of cheddar cheese, served with jalapeno ranch dressing. These are by far the tastiest balls you’ll ever put in your mouth. You know you want some, so just bite our cheesy balls”. Now with all of this wonderful food so far, you know the main meals have to be out of this world! And yeah, mom and dad wanted to sample a lot. And mom, we can’t leave mommy out. She went grandstand too. 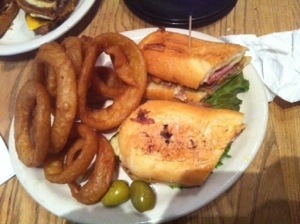 She got the Cubano De Libertad. Okay – let me add that this little oinker was not harmed in the making of mom’s lunch. See, that’s how she does me. She runs off and eats pork. Shakes my piggy head. At least she didn’t order the sandwich they call, “Three Little Pigs”… I don’t even want to know what’s on that one – Snorts. So, that’s my wild humans. 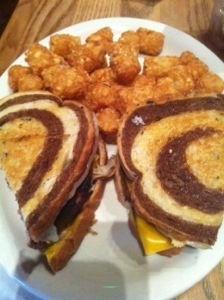 If you want to see more of the menu, look here at Vortex. It is by far great reading, mouth watering and delicious sounding. You gotta check it out if you get a chance. Happy Eats! Today mom and dad helped me by reminding me of a story at their true love – Savannah, Georgia. 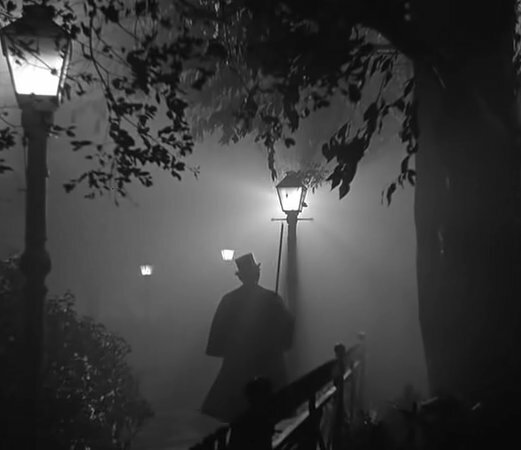 One of the must things to do in Savannah if you have never done it is to take a stroll through downtown at night on a haunted ghost tour. There are walking tours, horse and buggy tours or even a hearse tour if you dare. Many moons ago, mom/dad went with my mom’s sister and her daughter, my little niece Savannah. Nice name huh? Savannah must have been about two and they decided to do a night time horse and buggy haunted ghost tour. It must have been scary too because little Savannah stayed camped out inside of mom’s hoodie the entire horse and buggy tour. One of the last places on the tour was a little house called the 17 Hundred 90 Inn and Tavern. It’s a quaint little place, not so scary during the day but a night – chills. The 17 Hundred 90 Inn and Tavern is located at 306 East President Street, Savannah. The bottom floors have a restaurant and bar area while the upper floors have 14 suites in the inn. It has a long history of untimely death and ghosts. It was originally built in 1820 and is one of the oldest buildings in the Savannah area. The most paranormal activity revolves around poor sweet Anna who fell from the window of room 204. There are many stories about poor Anna – we really don’t know which one is the truth. One story states that she was married to the designer of the home, Steel White, who died in 1790 in a tragic riding accident. Anna fell in love with a German sailor who went off to sea and promised to return but never did. Anna found out that she was pregnant and realized that the German sailor never meant to return. In despair, she jumped to her death from room 204. Another story similar to the one above with Anna has Anna being a servant at the inn instead of being married to the designer of the home. The end is the same result though, her untimely death. People have reported the ghost of poor Anna leaning over them while they sleep in room 204. Other stories are of Anna caressing men’s cheeks and as they wake they see Anna crying and then jumping to her death out the window. Items are also often reported missing – wallets, jewelry, keys – all of which are later found mysteriously in a planter or behind a shelf. Stories were so rampant at one point in room 204 that the 17 Hundred 90 Inn and Tavern required any patron staying in the room to sign a waiver stating they would not request their money back should they not stay the entire night. Nowadays, it is no longer required because most people wanting room 204 are hoping for a little ghost sighting of poor sweet Anna. So this story was told on horse and buggy ride late at night through the streets of Savannah. Mom, Dad, my Aunt Tina and two year old niece Savannah who was taking up shop under mom’s hoodie. The mood was set. It was dark, a little misty. All you could hear was the clickey-clack of the horses feet, an occasional snarl from the horse and the soft tale of Anna coming for the tour guide. That’s when my niece Savannah decided to poke her head out to the world and say in her little child like voice, “Poor Anna”. So do you believe in ghosts, spooks and things that go bump in the night? Do you have a little adventure still left in you? Want a weekend trip at a haunted inn – I’ve heard that the 17 Hundred 90 has open reservations…. if you dare my friends. Some friends of ours in the deep south here took a picture of their home a couple of weeks ago. When they were looking at the pictures, they saw something that kind of stood out for them. They didn’t see it while they were taking pictures of their house. Do you see it? Would you go back into your home if this was your crib?